@heyhexx is an interactive social media responsive robot puppet theatre installation. This theatre, designed to be viewed through social media platforms, acts as an intermediary between the digital and physical worlds. Emotions expressed through social media interactions are translated into puppet theatre through the animated form of Hexx the Robot and HexxWorld. People interact with Hexx the Robot by sending it a tweet, which is analysed for the emotion contained within it. Hexx and its stage perform in real time in response to these identified emotions. At the same time, a video is taken of the performance, which is immediately sent to the original tweeter. By interacting with Hexx, people will be able to experience the emotive embedding in their messages through generating a new form of social media theatre. The project combines elements of puppet theatre, robotics, paper craft, real-time interaction, and data analytics. 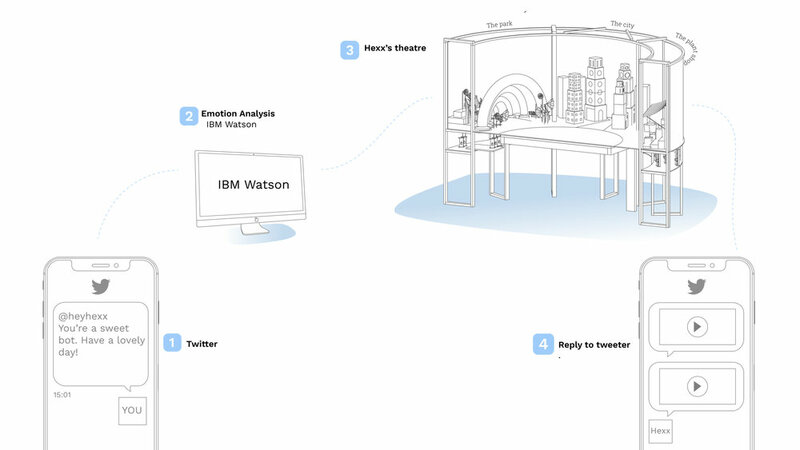 Custom built software streams incoming tweets to the Twitter handle @heyhexx, which are analysed for emotion expression through IBM Watson’s Natural Language Understanding. The interaction software drives the electronics in response and recorded video is relayed back through the Twitter API. The physical set is composed of dynamic origami structures and characters, carefully lit with dramatic lighting and animated through mechanical motors and pulleys.